My new book, PHOTO CAMINO, is now almost finished. It’s running at just under 45K words, and will be ready for publication in less than two weeks now. 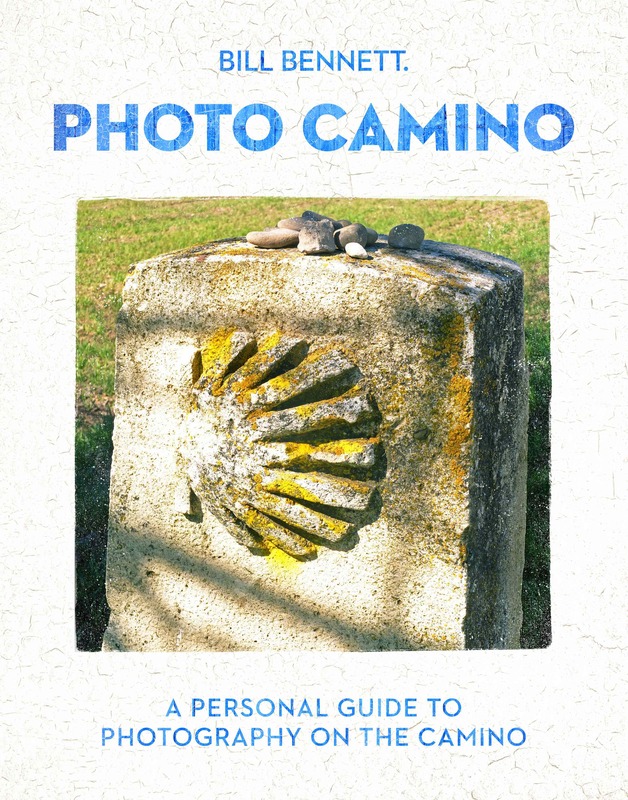 Complete with dozens of stunning photographs, Photo Camino is required reading for anyone wanting to take photos on the Camino de Santiago, or for those that simply want to discover the wonder of this ancient pilgrimage route. You and Dale will get a copy hot off the presses! What do you think of the cover Ingrid? Bill, I love it. Aside from the photographic eye you applied, this is what I see. The proportions of the stone marker with the carved concha, enduring, opposite the sorrow stones, vanishing – almost as if the monolith is absorbing the stones, like a meatgrinder- grinding them to dust to vanish in the wind and thus freeing us from the sorrow. The concha carved, a statement of endurance, that only the elements over time will erode, but in the meantime showing the pilgrim the way. The light that eluminates in a brightness to be able to reflect the shadow of what I see as a fence, and also some attempt to remove graffiti. Just as pilgrims, we start with many fences around our heart and gradually, the camino magically erases those to free our heart to fly. So, for me, you captured the essence of the Camino and with it a pilgrims heart. That brings me back to this day, which of course is Valentine’s Day. HAPPY VALENTINE’S DAY! ❤ ❤ ❤ ❤ ❤ etc., etc., etc., Love and LIght! WOW Ingrid. I will look again. I saw a Stone Camino marker with some pebbles on top. Guess I view the world simply. The cover photo is gorgeous Bill – it tells the pilgrim story so well with the stones on top of the waymarker, the rough texture of the waymarker itself which you can almost feel just by looking at it, and of course the waymarker star which is the first thing my eyes went to. The shadows are beautiful too – a GREAT photo! One thought I had for continuity and ‘branding’ for want of a better word, why not use the same font as you did for “The Way, My Way” on your cover? I might be wrong, but I think the James Pattersons and Alexander McCall Smiths of this world routinely use the same font for all their covers. Hi Jenny – good thoughts, thank you – and yes you’re right – the cover art, or key art as it’s called in the film industry, is consistent with those brand authors. I’ve tried to keep some consistency with the waymaker on both covers, and also the use of blue (font) and yellow (colouring on the waymarker) being the principal two colours of the Camino – however the font on The Way My Way is a handwriting font, designed to indicate that it was a memoir, and an individualistic one at that – whereas this is a photographic guide, and needs something else. Also what I’ve learned since that first book is that with an eBook on Kindle say, you need a cover that works as a thumbnail – it’s going to be read really small – and so the design elements need to be simple and the font needs to be easy to see. Would like to get into a position that I’m so popular as an author that I become a brand… haha! Cheers Bill – wow – there sure is a ton to think about with cover presentation alone. I’d love to see a novel Bill ! How about it? Get that BB brand happening ! Really? Sounds intriguing! Could INDIA feature in the novel? I wonder! Nice draft — and I love the cover image and its formatting, very snappy. As it stands, that white background might seem a little too stark — but that’s easily addressed by choosing the right cover stock. My 2 TB data hard drive totally crashed over 2 months ago, then my new 4 TB job needed an upgrade to a UEFI motherboard, which in turn needed a new CPU — plus an external HDD case for data extraction from the broken drive, which will take me several weeks to get done ; and if I didn’t know what I’m doing, ~60% of my data would have been lost for good. OOOOH I really like the cover photo 🙂 The colour yellow took on a new meaning for me from April 2012! Thanks Britta – yes yellow and blue now have special significance don’t they! What a good idea. A niche that hasn’t been filled before. I know this is going to be a tremendous hit. Congratulations! Hope it finds a readership Kathy! Thank you! Don’t really recall the brand of the one that crashed, Bill, but that’s unimportant info anyway — the failure was of a purely mechanical origin, as internal vibration caused the data cable to remove itself from the drive.